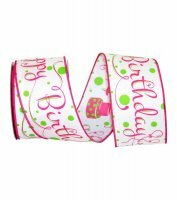 Make anyone feel extra special with this wonderful Happy Birthday Ribbon! The Coordinating Wired Edge makes it a perfect addition to flower bouquets, vases, centerpieces and more! Creating beautiful designs using this wire edge ribbon will add visual appeal to any project. ....Please select Blue Pink .